Current statistics suggest that in years to come, renting is only going to become more popular – that doesn’t mean we have to resign ourselves to a life of off-whites. We take a look at ways to give your rented space some personality and style without breaching your tenancy agreement. In a pale colour scheme, a green leaf can really pack a punch. Although often assumed quite complex to grow, an orchid will give your home an elegant touch of colour. For the less green-fingered tenant, an Areca Palm is a full and vibrant green that gives a tropical feel and will grow big enough to be a focal point. Spider plants could be another good option for those with a tendency to kill off their plants. Whatever you choose, plants will really soften a room. So many interior design schemes now feature exotic locations, it is easy to pick up some colourful crockery. Give your table a hint of the far east with coppers and include some Moorish accents with mosaic tiled patterns. Or, step back in time with vintage tearoom style. In particular, larger serving bowls and platters can be left as permanent table displays, or you can display them in a dresser for added personality. Colourful, unique and personal, art can transform a room. Choosing a large canvas will draw the eye and be all the more stunning for the pale-coloured walls around it. Larger works will save you making too many holes in the walls which you need to fill later, but if you prefer a collection of smaller images you could opt for a large frame with space for lots of images to give a collage feel. Make a room feel bigger and brighter with the addition of a mirror which bounces light and space around a room. You can go for something ornate or very simple, depending on whether you want some artwork or a more functional mirror. Think about different shapes too; a convex, port-hole style mirror could be ideal in a small toilet to give the illusion of space while adding a nautical theme. Alternatively, a large rectangular mirror resting on the floor and tilting upwards will give the room a greater sense of depth. Using fabric to cover a wall is a great way to express yourself; you can create a feature wall which only requires a curtain rail. Hang some material behind your bed to give a dramatic, sumptuous feel for minimal cost and effort. Pop into your local haberdashery to peruse the colourful fabrics. Not only is this a relatively cheap option (dependent upon the fabric you choose, the size of your wall or the proportion of wall you want to cover), but it is also easily changed, unlike wallpaper or paint. You can change your style according to the season or even your mood. Like this post? Read more about the rental market on The Guild of Professional Estate Agents website here. Beige, bland carpets can be the backdrop to some spectacular floor art: welcome the rug. From spiced Moroccan coloured runners to a faux fur rug, a well-placed mat can give your home bags of personality. What is great about this is that you are able to keep your other items fairly neutral, making them perfect for taking to your new home which may be very different. 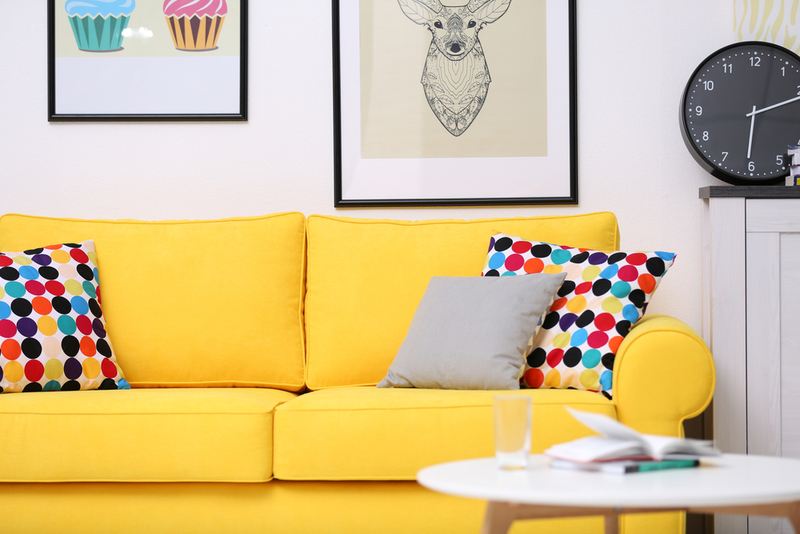 From cushions to bedding, carefully picking patterns and colours for your textiles will convey a homely, loved feel – which makes a huge great difference to rented space. Play with different textures and materials in complimentary colours for a layered, expensive look. Think outside the box and add tiles for a quirky feel. While you are likely to have a splashback in your kitchen already, resting some bold impactful tiles behind the cooker will inject colour. The bathroom is another good place to try this; if you have a shelf or a window sill, rest a few tiles on it. They will seem in keeping with these rooms in particular, even though you are using them more like pieces of art. Don’t be afraid to choose different types of tiles; a mismatched pattern with a recurring colour scheme will make for an eclectic space. Add a freestanding lamp to your living room to create an expensive and tailored look. You can make a reading nook with a low-hanging lamp over a comfy chair, or perhaps light up an alcove with an uplighter to showcase features. Table lamps will also help to style your home, whether they are on your bedside table or in the hall; the right lamp is always a feature. If it’s feasible, a statement chandelier could give a room real drama. This is perhaps one of the most obvious ways to make a space your own. If you are in an unfurnished property though, it may be that you have bought a collection of cost-effective furniture which could be a little bland. A way to avoid a white-washed room or a pine frenzy, is to choose one item which is unique and turn it into a feature. Charity shops could be a fantastic source for something which is still relatively cheap, yet totally different to the rest of your items. Don’t be afraid to sand furniture down and get the paint brush either!